I’m happy to announce I am the last stop on Heather Saffer’s Holiday Blog Tour to celebrate her new cookbook The Dollop Book of Frosting. In case you aren’t addicted to the Food Network like myself, Heather was the winner of the fourth season of Cupcake Wars. She was especially talented at creating unusual and delicious recipes for frosting and icings which she shares in her new cookbook. 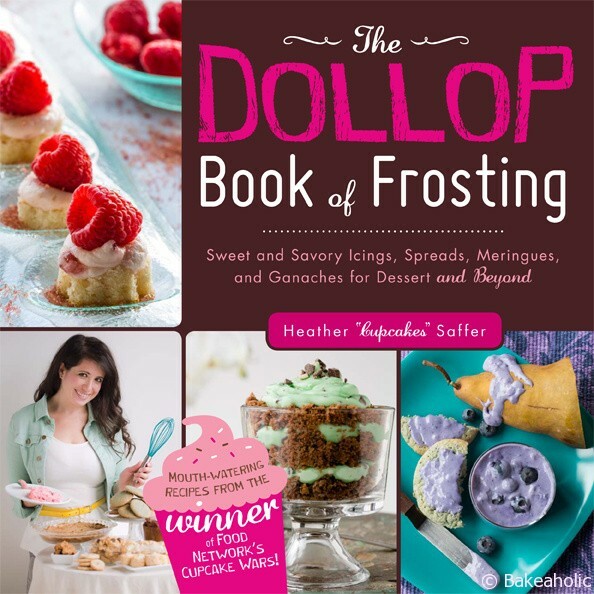 The Dollop Book of Frosting shares sweet and savoury recipes including creative combinations such as honey mustard frosting for corn dog cupcakes or concord grape frosting for peanut butter granola. The recipes are unique and delicious. For the holiday blog tour I decided on something decadent, perfect for sharing with friends and family at holiday get togethers. I prefer making cupcakes to a whole cake especially for large gatherings. it is much simpler than cutting into a cake, and the serving size is perfect. Also, I actually dislike baking and decorating entire cakes. Cupcakes are easier and more appealing at a party. Arrange cupcakes on cake stands or platters. You can also wrap them up in small clear treat bags and tie a big ribbon on top for individual gifting, or to take home for a late night treat. 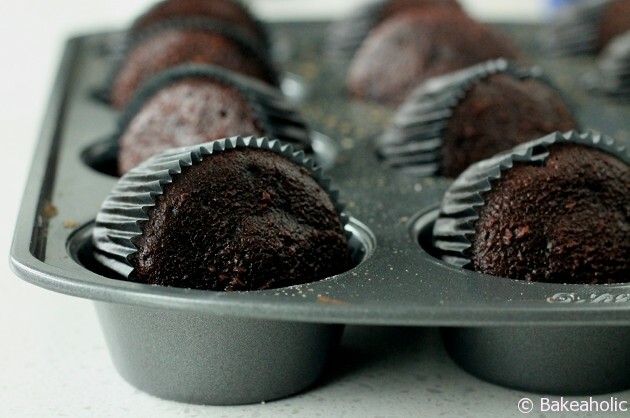 Double Chocolate Cupcakes - a moist chocolate cake topped with fluffy chocolate buttercream. 1. Preheat oven to 325 degrees F. Sift all dry ingredients together in large bowl. Add all wet ingredients and mix well. 2. 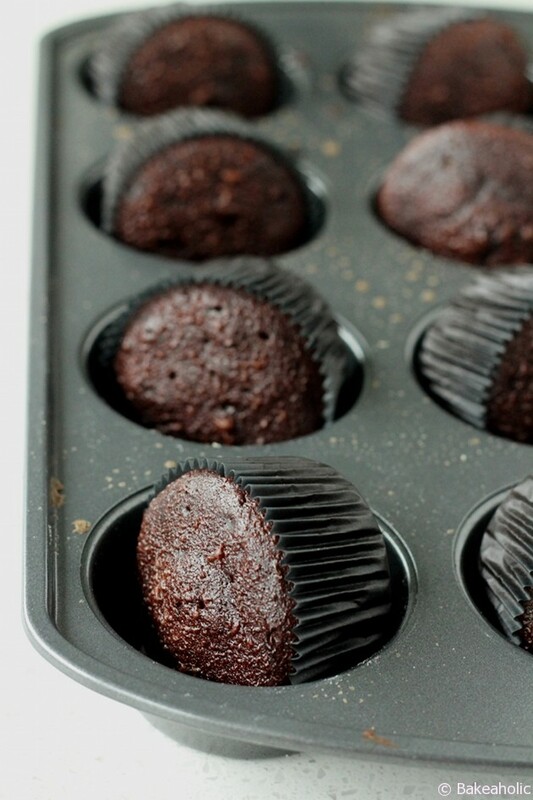 Scoop into lined cupcake pans and bake 10-12 minutes or until toothpick inserted in centre comes out clean. Remove from oven and allow to cool. Cream butter until smooth by placing it in the mixing bowl fitted with the paddle attachment and mix on low speed, about 2 minutes. Add vanilla and continue mixing an additional minute. Sift cocoa powder and add to mixture. Sift sugar and slowly add and continue mixing about 3 minutes. Mix in fudge and whip until fluffy, about 5 minutes. 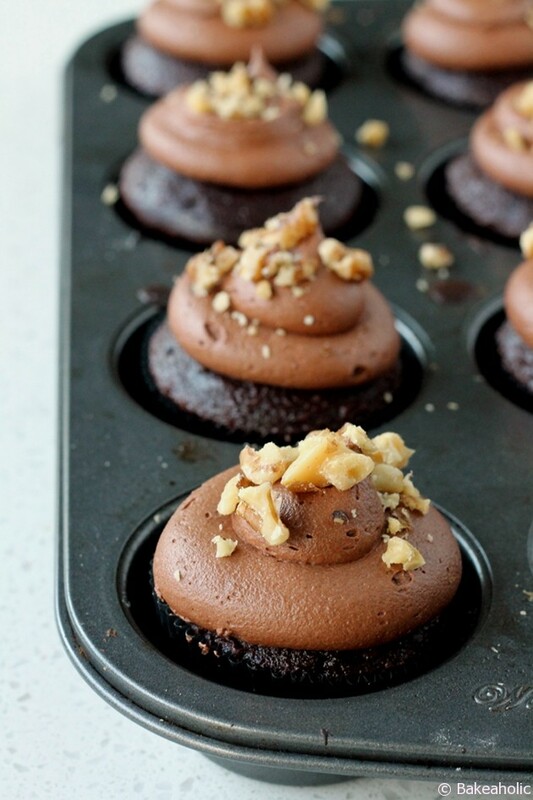 Transfer to piping bag and pipe onto cooled cupcakes. Sprinkle with walnuts, optional.